What's included in the Remote Styling fee? - With Remote Styling we'll have a chat over Skype or Facetime. We'll discuss your current wardrobe situation, your goals, what makes you comfortable or uncomfortable, etc. After our 1 hour chat, I'll take a week to prepare an email with links to items I think will pair well for the coming season and with items already in your closet. I’ll include a visual lookbook of inspirations and how to pair the items I’ve sent you. Once you pick out what you're going to buy, it will arrive and we'll have another Skype or Facebook session where we review the fit and how to pair it with other new items, as well as pieces you already own! Are there any discounts available? - We are currently working with some retailers to offer a special discount for Shop The City shoppers. What's included in the Closet Audit experience? - We'll start with coffee or a mimosa, supplied by moi, as we chat about your current wardrobe, goals, etc. Then we'll take it to the closet. I'll make piles of your items, review the fit and condition of the items, and see what can be kept, stored, or donated. 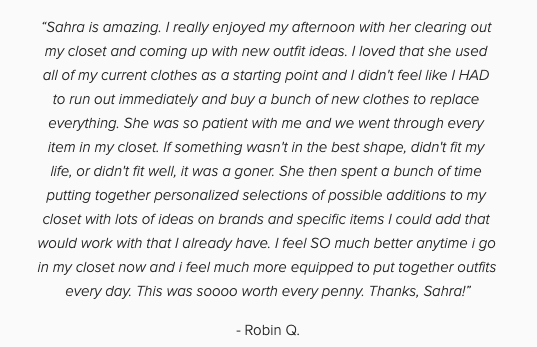 I'll help you organize your clothes into something that makes sense and will be accessible for ease of getting dressed each morning. After that, it's time to fill your closet with the shiny and new! I'll take a week to prepare an email with links to items I think will pair well for the coming season and with items already in your closet. I’ll include a visual lookbook of inspirations and your go-to looks we’ve put together from your closet with guides on how to pair and style everything. Any tips for before we get started? - Absolutely! We recommend making sure all of your laundry is clean, so we can do a full inventory of EVERYTHING. We also recommend bringing out any seasonal items that may be hiding away. What’s included in the personal shopping experience? - For your personal shopping experience you’ll be given an all access day of shopping (4-6 hours) with our educated stylist. She’ll take you around to shops in your area, helping you find trendy pieces that fit you and your budget, while showing you the best ways to style them with other classic pieces you own or pieces you’re shopping for. Are there any discounts to the shops we go to? - We've partnered with some of our favorite local boutiques to get you the best price on your new wardrobe. Discounts range from a free gift to 50% off in some shops! 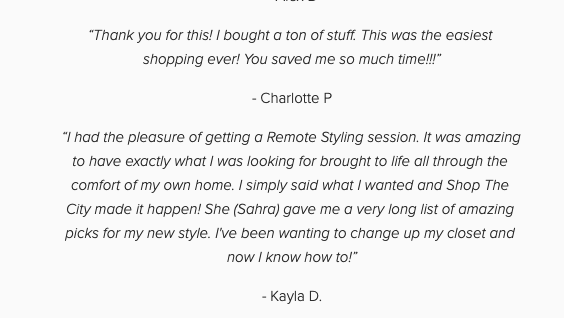 It pays to shop with us. Is there any pressure to purchase? - Nope! 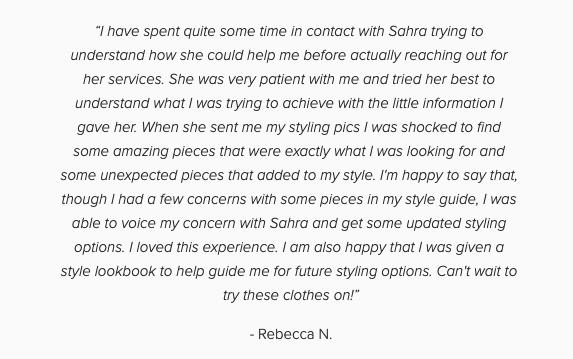 We’re not sales people and we’re not commission based; our main goal of any styling session is to ensure you understand the tips and tricks to make you look and feel your best. Shopping for 5 hours - is lunch included? – While a formal lunch is not included we will have the opportunity to grab a coffee or quick bite at a totally 'grammable hangout. Is there a maximum number of guests allowed to book at once? – For ease of shopping and to keep things timely we ask that you try to keep your group under 12 people. What if I want to keep my group or party intimate? – We can definitely work with you to provide a closed-group experience. Please send us an email with your date in mind and what you are looking for. What is included in the ticket price? – With your ticket price you'll get a guided tour by a personal stylist, a tote bag to store all your purchases in, a map of all the stores we shop at, as well as special discounts to our partner stores. What if I want to stop at a store that's not on the tour?– We want to make this shopping experience the best possible for you! We're happy to make any additional stops but ask that you be mindful of the other members of the tour. Are there any discounts offered from the shops we visit?– We have partnered with a number of stores on each tour to offer a special discount to shoppers. Shopping with us has it's perks! Are the pick up and drop off locations the same? – Unfortunately, due to the tour covering a bit of ground your ending point may not be where we started, but will be close to public transportation and our guides will be there to ensure you get where you need to be safely. Is there a strict time frame per store? – There is not! If you're having fun feel free to enjoy it, but please be mindful of the other tour members who may be ready to move on. I see that you're in SF and DC - any plans to expand?– Absolutely! We hope to expand to more cities soon so be sure to subscribe to our email list to be the first to hear about our next cities! What is your refund policy? – Services canceled up to 72 hours in advance will received full refund. Tours cancelled 72 to 24 hours in advance will receive a 50% refund. Last minute cancellations will be charged the full amount. We understand life happens and sometimes you can't make it, so we can evaluate on a case by case basis. What if my tour is canceled because of inclement weather? – Sometimes the weather is a drag. In times of inclement weather (blizzards, hurricanes, etc) we will cancel the tour for your safety. In the event of this we will try to offer you the next available safe day to tour or we can provide you with a full refund. What if there's a no show? – No shows will be charged the full amount.